Looking for birthday ideas for children? We’ve rounded up 21 of the best birthday ideas all in one place! And #13 is our favorite, hands down. If you are looking for some amazing Birthday Party Ideas for Children, I have good news. 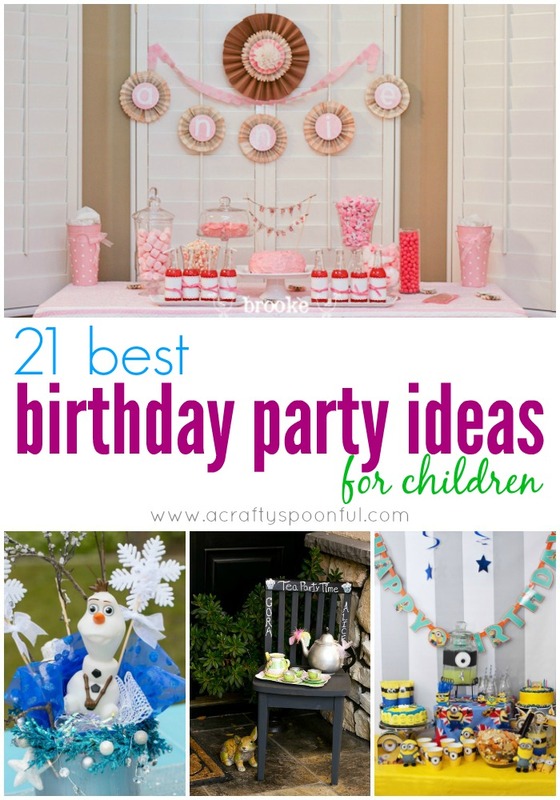 I’ve gathered up some of the top party ideas for children of every age, gender or interest. With tops tips, tricks, recipes and decor ideas, you won’t have to strain your brain to come up with some wonderful party plans of your own! Jump right in and find the idea that’s right for you! 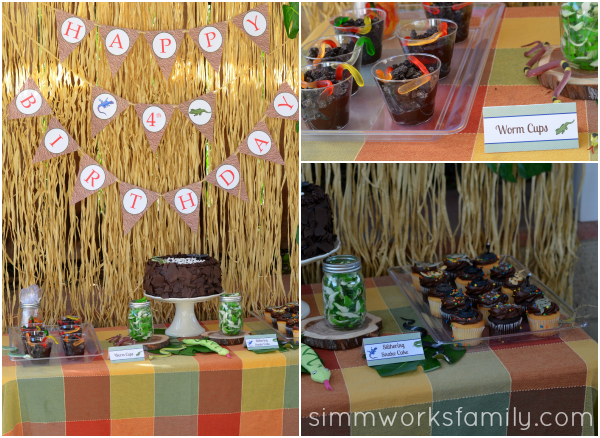 This fun birthday party post includes templates and printables to help you plan your very own Disney Brave-themed birthday party. 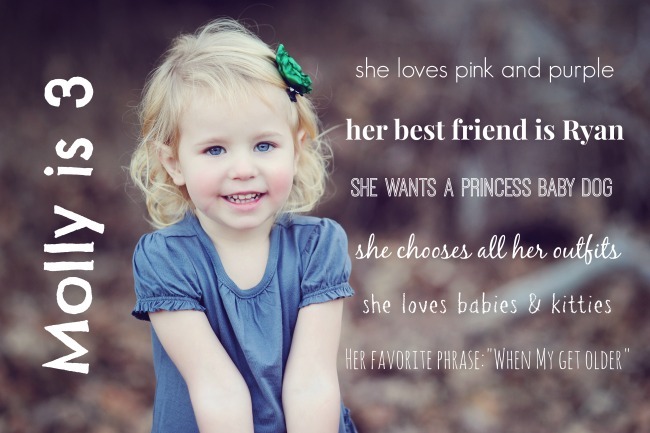 Perfect for little girls OR boys! Everything you need to know about food, decor and party favors to help you create the best experience at your kids’ favorite pizza place! If your kids are the athletic types, it makes sense to give them a super fun sports-themed party. Here you’ll find recipe ideas, sporty games to play and awesome sporty decor, too! Too often, Mickey Mouse gets all the attention. 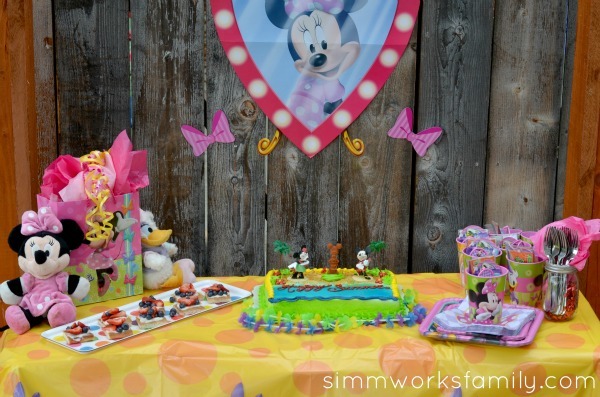 But if your little one is Minnie Crazy, then you need to feast your eyes on this Minnie Mouse-themed party that features creative decor, food and treats that the whole family and all your friends will love. 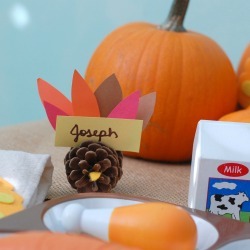 For your favorite little girl or boy who loves nature and the outdoors, here is a fun and beautiful party idea. Ahoy mateys! It’s a pirate party, and this one has it all. Seafood and other pirate-themed foods, easy decorations and even costumes. Your kids will love it! Another fun take on a pirate theme, this one has a Halloween twist! Perfect for your little one’s birthday, OR as a themed Halloween party! 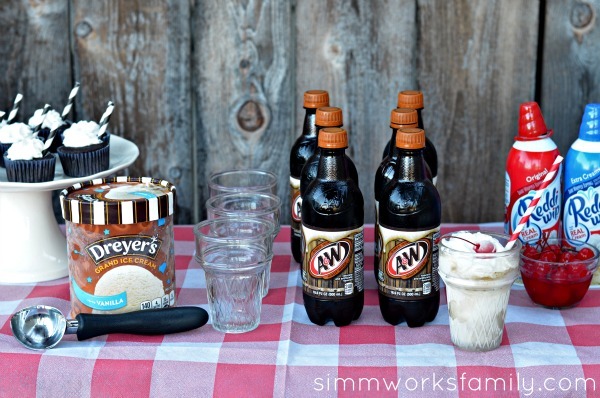 While a traditional barbecue may not appeal to some kids, renaming it into a Root Beer Float Party will surely get them excited! And happy bonus for the grownups – you can totally still have the barbecue! This one features healthier options, as well as the star of the show – Root Beer Floats! I don’t know a single child that doesn’t love The Very Hungry Caterpillar, and the theme lends itself so well to a young one’s party. It’s an especially good one for those with allergies or health concerns, as it is the perfect party to load up on fruit! I can’t say enough about the thought that went into this Frozen-themed party. Any child would be delighted to host or attend such a fabulous party, and this will give you a load of ideas on how to throw your own for your little Elsa or Olaf. This two part party post features amazing food and games to help you throw an incredible Angry Birds-themed party that your little ones will be talking about for ages! Have you got the girliest girl who loves to feel fancy? Then check out this adorable party plan that just screams fabulous! Does your child love all things creepy and crawly? They will love this reptile theme! Featuring creative naming of traditional food and drink (Swamp Water? Gecko Grapes??) and ideas of entertainment and decor, this one is perfect for your slithery snake lovers! This super adorable party plan will make your little one feel like The Little Mermaid on their special day. This is one awesome Princess party plan with some free printables to help you make it easy to throw your own! If your kids love animals and the outdoors, you must consider the fun that comes with planning a farm-themed birthday party! If your kids are as Minions-obsessed as most, they’re going to LOVE this party idea. Find out how to make an amazing layered minion cake and other fun projects for your party. If you want simple and classic, you can’t go wrong with this fun Cars-themed party. It doesn’t get any easier than chocolate donuts posing as car tires! I have two words for you: Wookie Cookies. Your kids will love the amazing food ideas from this Star Wars themed party! Cuteness cannot be contained when you throw your little one this delightful Princess Tea Party. Edible DIY necklaces, magic wands and fabulous flowers and food are going to wow the adults as much as the children! With all of these birthday party ideas for children, you are sure to be able to come up with your own take to make your next party amazing. 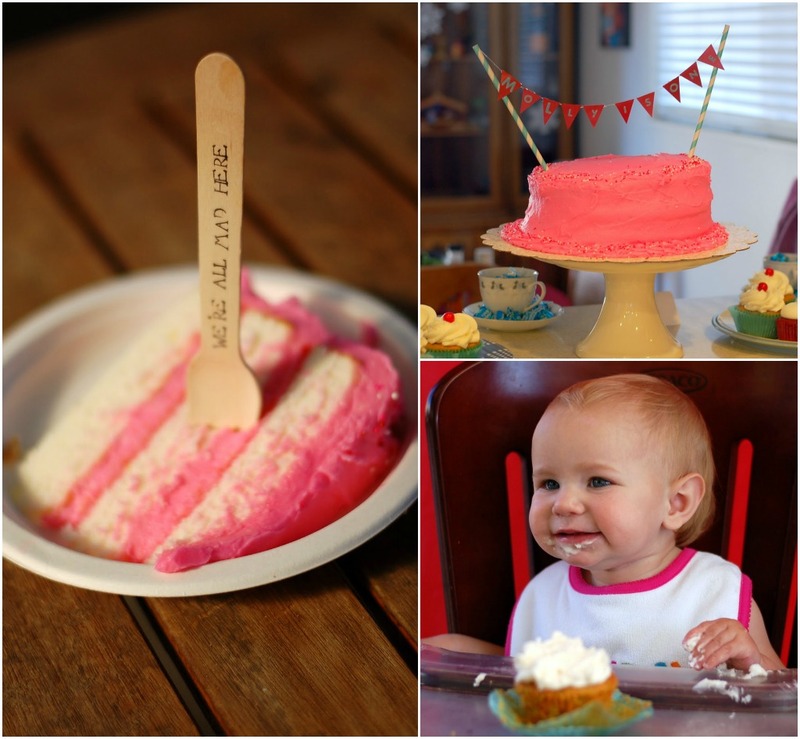 What is your favorite birthday party theme for kids? This post on the Ultimate Girls Night Out is sponsored by SheSpeaks and P&G. 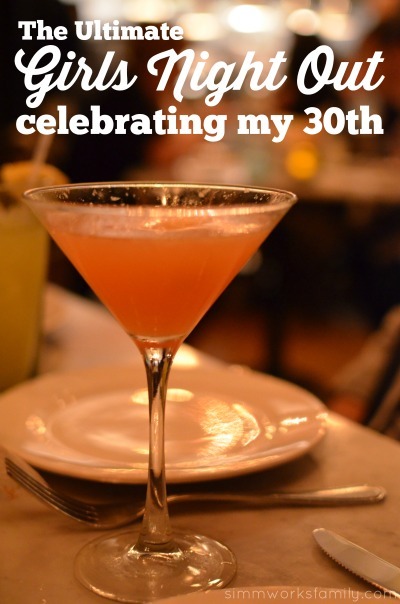 Last month I celebrated my 30th birthday with the ultimate girls night out. I’ve been talking about how I was going to celebrate my 30th for the past year and finally I decided on an awesome night out with my friends at a great restaurant. I made sure that everyone had rides to and from the restaurant and that the whole meal was taken care of so all my friends had to do was show up. My husband chauffeured most of us (his idea!) and surprised me by gifting each of my friends a cute favor that was left at the restaurant before we got there. Photo courtesy of Grin & Share It Photography. My baby is turning 3 tomorrow. 3 years old! How did that happen? 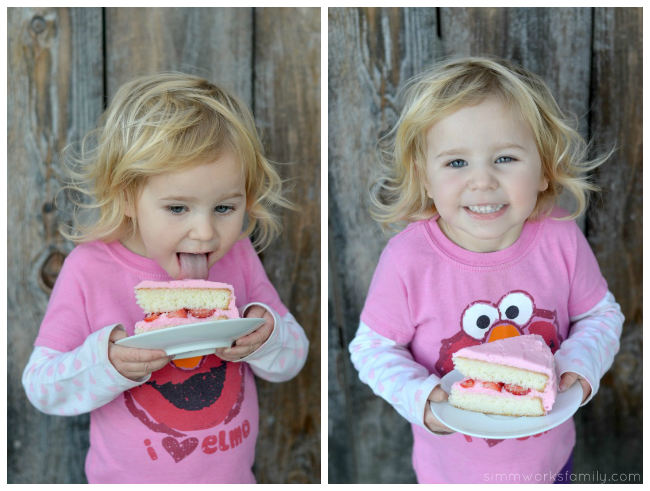 In celebration of her birthday we baked together and made her a delicious white party cake with pink strawberry frosting. It’s a trial run for the cake I’m making for her party on Sunday and I think it’s a winner! Every year I bake my kids a cake or cupcakes for their birthday party. We end up having both cake and cupcakes but I try and make one of them. And without fail I’m baking the night before the party and always have to re-do everything because my cakes stuck to the pan. Well not this year. I busted out my secret weapon: Baking PAM Cooking Spray. Not only is it the perfect non-stick spray, it also has flour in it so my baked goods come out perfectly every time. The kids are slightly disappointed because they don’t get to eat up all of the cake crumbles from the broken cakes that I’ve just about ruined. But I’m happy because a cake that slides right out of the pan means less work and stress for me! 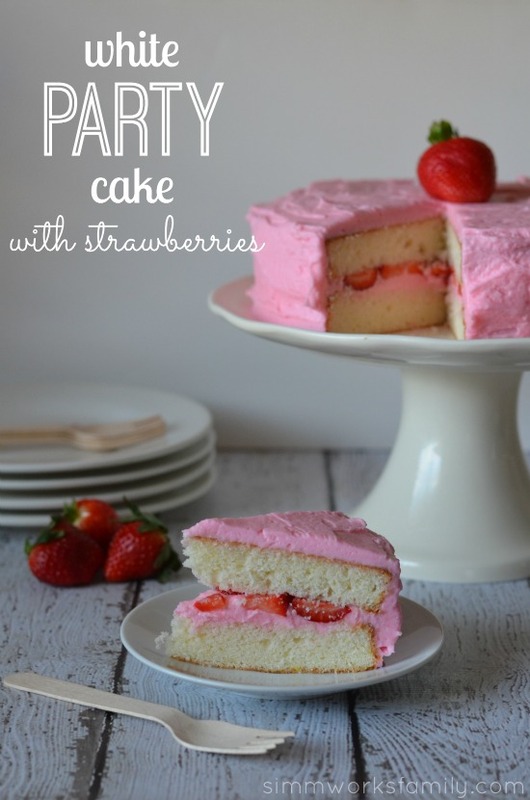 There’s nothing better than a moist, delicious cake to celebrate the birthday of a loved one! And this cake is my husband’s favorite. 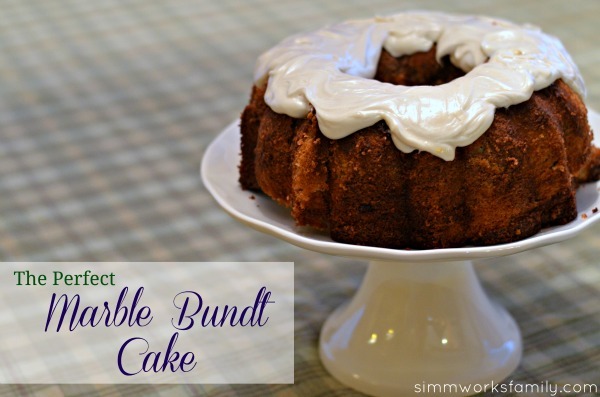 His birthday has already come and gone and this recipe has been sitting here waiting to be shared since April. Yeah, I know.. I’m a bit behind. There’s something simply magical about a child’s birthday party. No matter what age they are, birthday parties are filled with joy and cheer! So when we asked my daughter what she’d like for her second birthday we were thrilled to hear that she wanted to include her love of ladybugs. 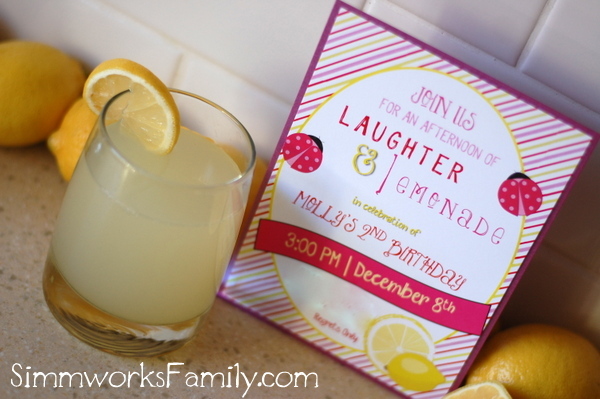 And with that her ladybug lemonade birthday party was created. After quite a few months of pinning great ideas, designing her birthday invitations (and asked the wonderful Cherish Paperie to print them), and coming up with a few ideas of my own for the food, decorations, and entertainment the day was finally here. And we were ready to party! Find out how easy it is to make a dinosaur party hat with this template and some paper. 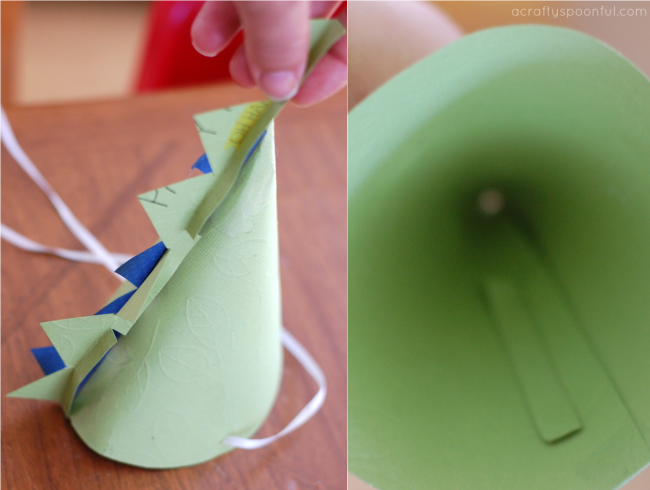 When planning my son’s Dinosaur Train birthday party I stumbled upon an Etsy store with printables for everything Dinosaur (you can check them out in detail on her blog). 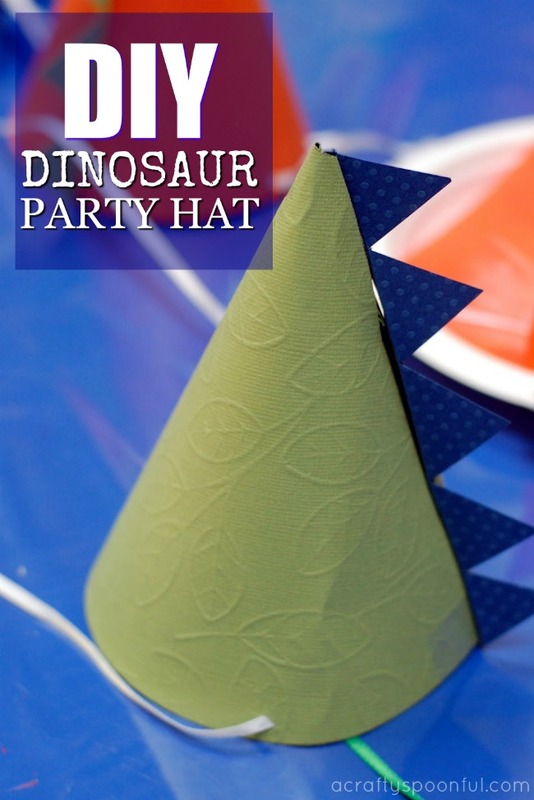 One of the things included in the kit was a dinosaur party hat. Since I wanted to make my party unique I opted out of purchasing the kit but I did find a way to make those adorable party hats! I used a template I found from Oh Happy Day for the base of the hat, picked up some cute cardstock from Michaels and got cutting and piecing together. 1. 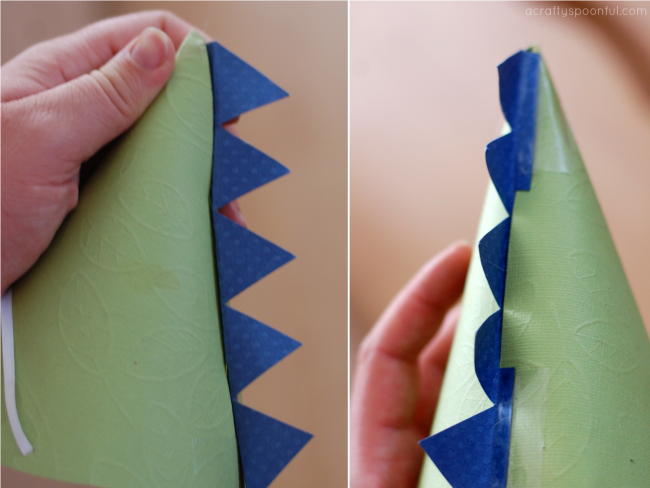 Print template onto cardstock (save 1-2 colors for the spikes). 2. Cut out the template by following the solid black lines. 3. Cut out the slit on the template. 4. 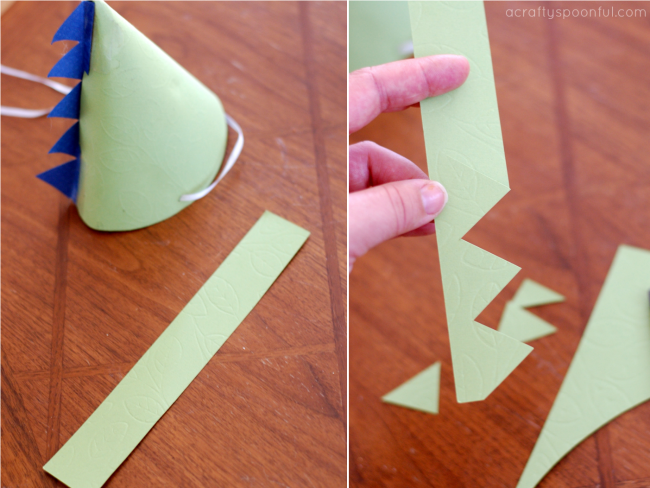 Roll hat together and place tab into the slit. You may have to bend the top tab a bit to get it to fit. Once the tab is in, lift the top tab again so it doesn’t slide out. 5. Cut out spikes leaving a 1/4″ space at the bottom of each spike row. 6. Bend spike row on the bottom at the 1/4″ mark and cut the middle of the spikes to slide into the slot. 7. Tape spikes down from the outside and inside of the hat. 8. 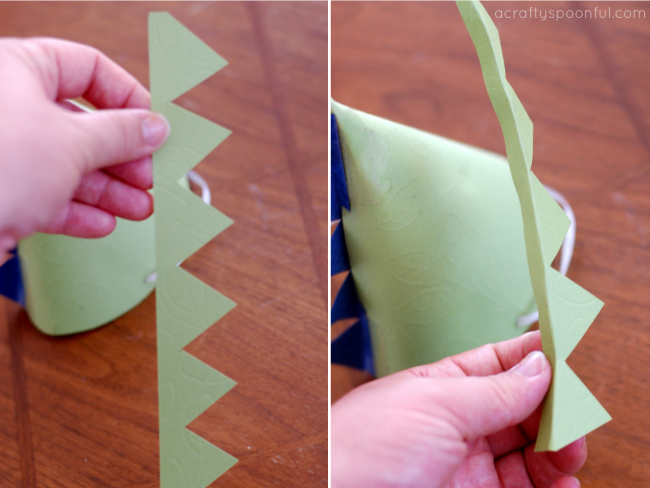 Using the X-Acto knife, make a small X on either side of the hat. 9. 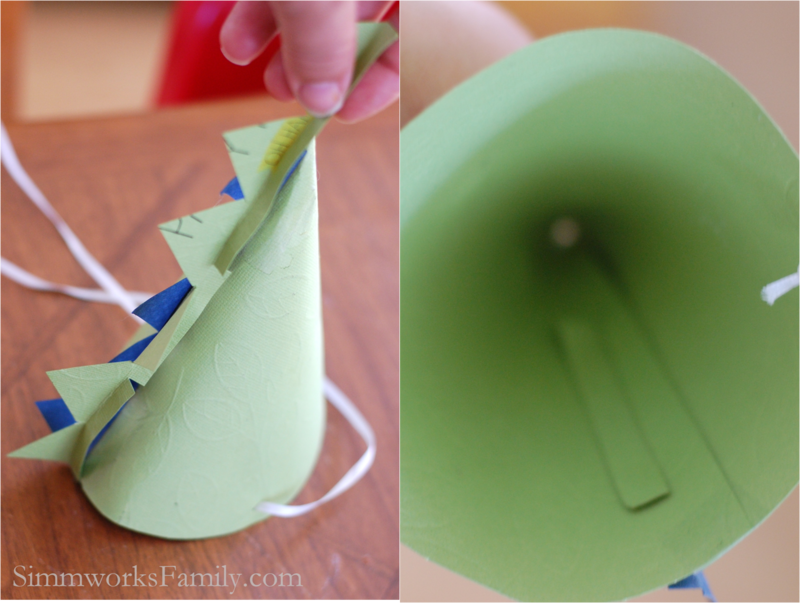 Place the ribbon or string in each hole and knot on the inside. 10. Decorate the hat more from here or leave as is for the perfect Dinosaur Party hat. 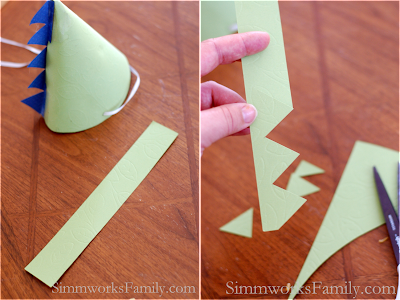 Do you have more ideas to make a party hat perfect? 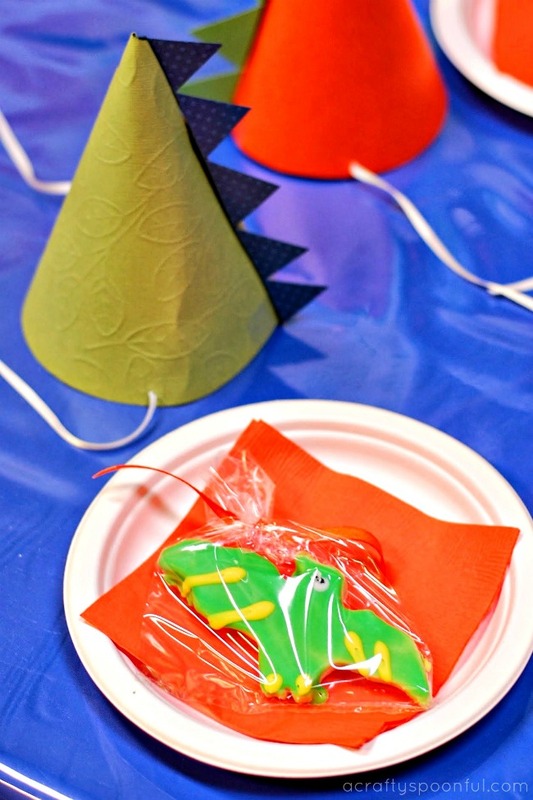 When my son mentioned having a Dinosaur Train themed party a few months back I was happy to start planning out all of the details. 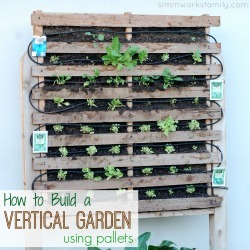 I searched through Google and Pinterest and even created a board of inspiration to go off of. But I was surprised to find very little in the form of ideas and details. Most of the posts I came across linked back to the same two designs and I didn’t quite love them. So I decided to pick and choose design elements from various sources and pieced them together to form my son’s Dinosaur Train birthday. Any dinosaur themed birthday has to have a volcano cake. It’s a must. And my kid is kind of obsessed with any thing that explodes. We recently purchased a mini volcano set from Lakeshore Learning Center that allows you to add baking soda and vinegar to watch the volcano erupt over and over again. It’s one of the only toys that he asks repeatedly for every night when daddy gets home! I had great visions of multi-tiered, fondant covered cakes with tunnels and trains but just couldn’t come up with the money and lacked the talent to make one myself. So this easy-to-do volcano cake was my go-to. And boy did it give me trouble! The bundt cake stuck in the pan not once, but twice, the day before the party. But I just went with the flow and pieced the second failed cake together to create my final product. To read more about the volcano cake check out my post here with recipe and design details. In addition to the volcano cake, I also made cupckaes for the kids. They’re much easier to deal with when feeding 3 year olds and the kids love them for the frosting. When I searched for ideas for cake toppers I knew my friend, Jeanna, over at the Sweets Fairy Bakeshop would know just what to do. She created these darling toothpick cupcake toppers with dinosaur train images on them and even created some decorative dinos and train fondant pieces to go along with the theme. 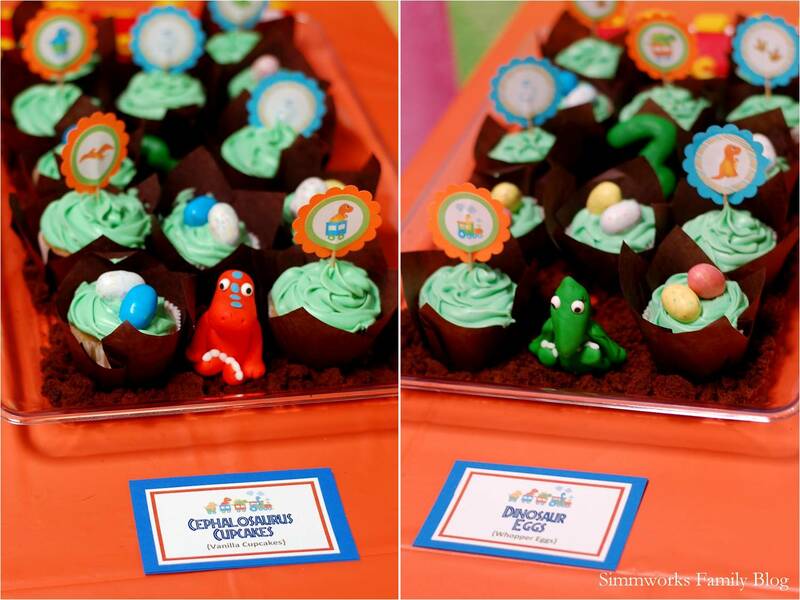 We placed the dinos and trains around the cupcakes and sprinkled the tray with the first bundt cake crumbs (way to reuse, right!?) to give the illusion of the cupcakes laying on dirt. Half of the cupcakes had the cute toothpick tags on them and half had whopper eggs on them to make dinosaur nests. The recipe I used for the cupcakes is from Glorious Treats. Yes, I know it seems silly to have place settings for a kids birthday but I thought this added a special touch. My husband’s aunt surprised my son on the morning of his birthday by dropping off some dinosaur cookies. These cookies were absolutely adorable so I asked if she wouldn’t mind making a few for his party too. 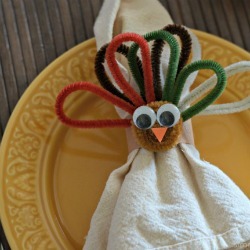 She packaged a few of them up for each kid and put them in a plastic bag with ribbon to make cute favors for the table. 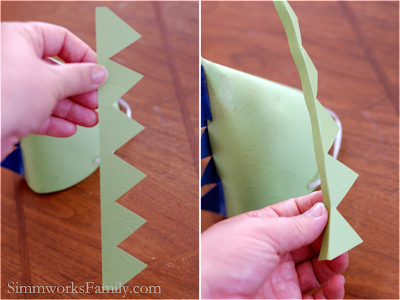 I also made some dinosaur and train paper hats for each of the kids as well and set them next to each plate, napkin and cookie. 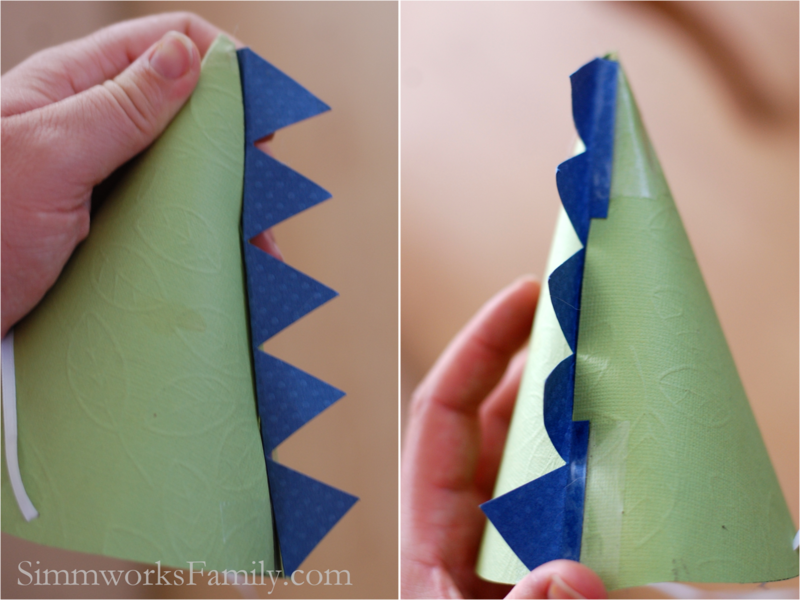 To read more about how to make your own dinosaur party hats check out my post here. I was amazed at how much the kids (and adults) loved the breakfast burritos. They were seriously the easiest thing I’ve ever done besides ordering pizzas and pleased everyone. And since we live in So Cal everyone loves Mexican food! We also served some hot carrots and had salsa on hand. We also had Jurrasic Juice for the kids and coffee & tea for hte adults. Since the party was held at a place with a cafe there was no lack of caffeine. For the food and drink labels I simply designed a template in Word that included the name of the food and the dinosaur train image. I played around with the fonts and downloaded a Jurrasic Park font from FontSpace.After playing around with the fonts, sizes and picture I decided to add a thick orange line around the wording and picture. After I printed the pages out I cut them to size and layered them with blue cardstock. I did the same with the favor bag tags but used a different layout and orange and blue cardstock (without the orange line). I absolutely loved how the signs turned out. They were perfect for the party. We tried to include some fun goodies for the kids to take home in their favor bags. It all started with the wooden train whistles I found in the dollar section of Target. My son and I painted and personalized the whistles for each of his guests. He had so much fun in the process and was so excited to give each bag to his friends (later at the party when he found out he didn’t get to hand them out he was a little upset but we remedied that by showing him all of the presents he received!). All in all I’d consider this party a big success. I loved talking with my son about what he wanted to include and how he wanted to celebrate. And seeing the joy in his face every time he talked about his “Dinosaur Train party at Kid Ventures” was more than enough reward for us. I’ll be posting more about my experience with KidVentures and their party packages soon! I hope the guests had as much fun attending the party as we did throwing it! Disclaimer: This post may contain affiliate links. By using these links you are supporting the Simmworks Family Blog. Our family loves pancakes and waffles. But we hardly ever get to making them on weekdays. So when my son asked for pancakes on the morning of his birthday I had to give in. But I couldn’t just make any normal pancake. 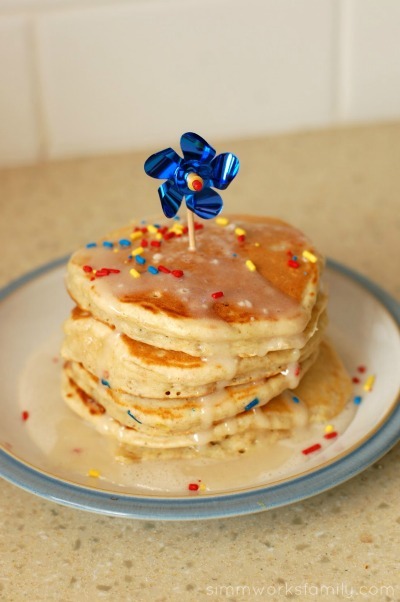 They needed to be special birthday pancakes! So I grabbed a box of multigrain pancake mix from Trader Joe’s and got to work. 1. If you aren’t making your pancakes from scratch (they’re super easy to do!) pick out a multigrain mix. Grab the sprinkles while you’re in the pantry. 2. Mix ingredients together and let the batter sit and thicken. This will allow the batter to thicken and make fluffier pancakes. You can add in sprinkles now or wait till later. 3. Preheat your skillet on medium. 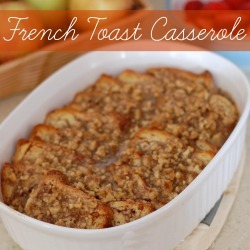 You’ll know it’s ready when you place a few drops of water on it and they sizzle and evaporate quickly. 4. Grease skillet with butter. Then wipe away any excess with a towel. 5. 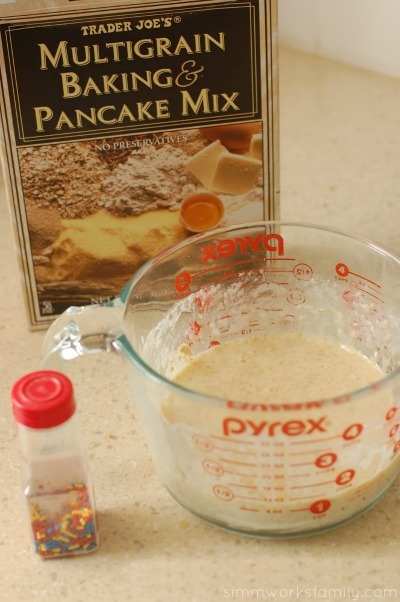 Place no more than 1/4 cup of batter for each pancake (unless you’re a pancake master). 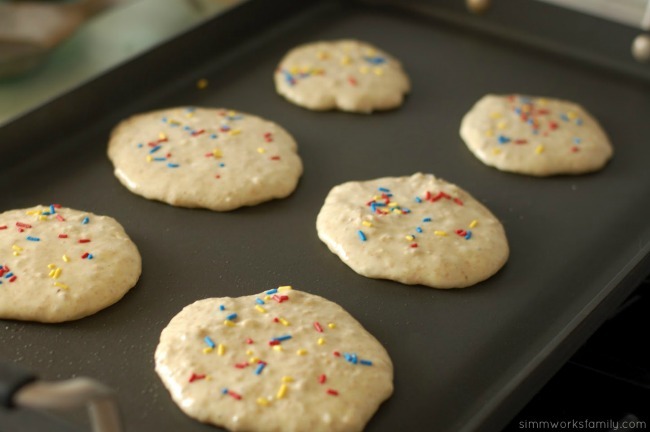 Sprinkle each pancake with sprinkles and set timer for 1.5 minutes. 6. 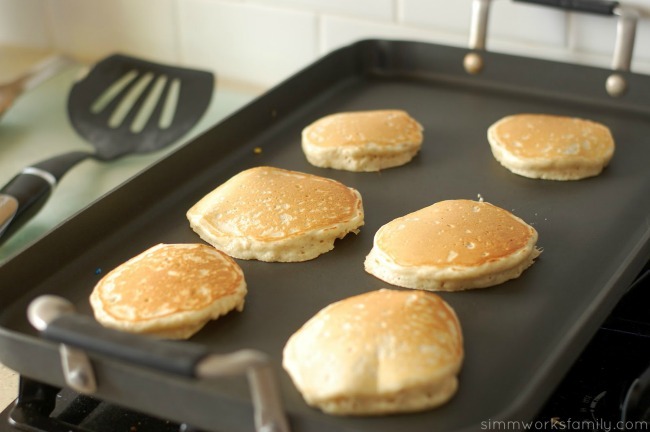 Turn pancakes when the edges start to bubble or when timer goes off, whichever comes first. The pancakes should be golden brown. 7. Let the other side cook for 1-1.5 minutes or until golden brown. 8. Place pancakes aside and cover loosely to keep warm. You can also put them in a 200 degree oven if you have a lot of pancakes to make. 9. 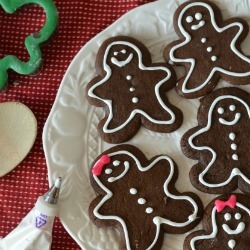 Make a special icing instead of using syrup and butter. Take 1/2 a cup of powdered sugar and add in 1-2 tablespoons of milk. Stir vigorously to combine and remove lumps. Add more milk if too thick. Add 1-2 teaspoons of maple syrup to the icing. 10. 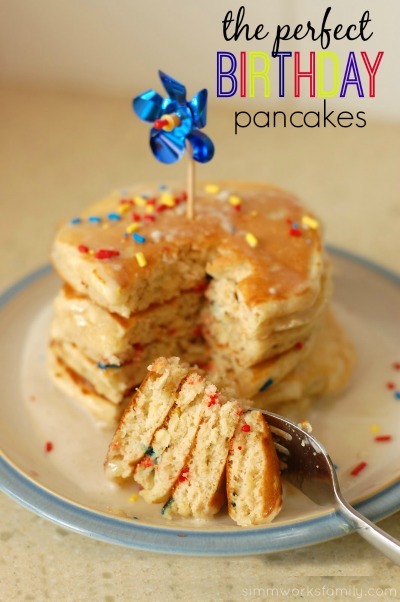 Top with icing, sprinkle more sprinkles on top and include a candle or fun cupcake topper to make this special stack of pancakes perfect. 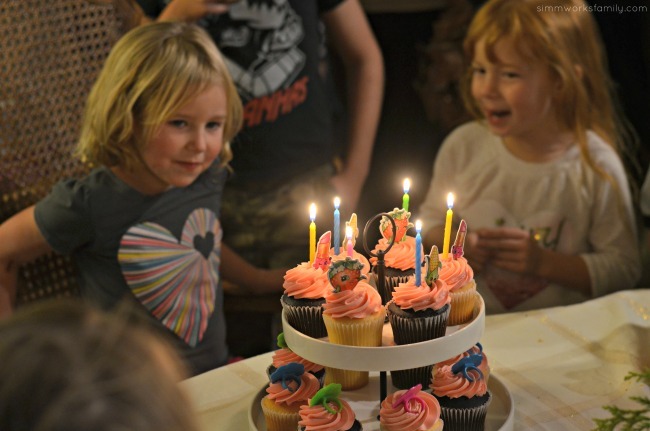 What do you do to make your child’s birthday special?